Spaghetti with tomatoes, basil, and toasted bread crumbs sounds so boring. I get it. But sometimes the most basic of ingredients can come together and transform into something that is greater than just the sum of their parts. Such is the case with this dish. Of course, it’s important to use quality ingredients but if you look at the ingredient list, you won’t find anything fancy. No, it’s when the ingredients get tossed together that the magic happens. They come together to become a silky sauce that gently coats the spaghetti with rich flavor. The inspiration for this recipe comes from this month’s issue of Bon Appétit magazine where they share the secret of achieving that “saucy, glossy, silky” sauce. The technique is really simple and a good one to have in your cooking toolkit. You basically build a sauce from the pasta cooking liquid, some butter or olive oil, some aromatics like garlic, and some cheese. That’s it. From those basic building blocks you can add an endless array of other ingredients to make a pasta dish that suits your tastes (or what you happen to have in your fridge or pantry). 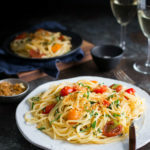 I decided on the classic combination of garlic, tomatoes and basil because 1) we can still get great cherry tomatoes at the farmer’s market and 2) my daughter made a dish similar to this using fresh tomatoes and I was reminded how good that combination can be. Although I was tempted to add some crumbled bacon to the final dish, I decided I wanted to keep the dish vegetarian. So, I opted for my other favorite topper – a fried egg. Because runny yolk + silky sauce = pasta perfection. While the water comes to a boil, prepare the bread crumbs. Heat 2 tablespoons olive oil in a large sauté pan or dutch oven over medium heat. Add bread crumbs and sauté until bread crumbs are crisp and golden brown, about 5 minutes. Transfer bread crumbs to a small bowl. Set aside. Wipe out the sauté pan with a paper towel. When the water comes to a boil, salt the water generously and add the spaghetti. Cook spaghetti until very al dente, about 8 minutes. Turn off the heat under the spaghetti. In the same pan used for the bread crumbs, heat remaining 2 tablespoons of olive oil over medium heat. Add the garlic and sauté until fragrant, about 30 seconds. Add the tomatoes and sauté very briefly. Using tongs, transfer spaghetti from the saucepan to the skillet. Add 1 1/2 cups of the pasta cooking water. Bring to a low simmer, and simmer until the spaghetti is al dente, tossing often. Add another 1/4 cup of the pasta cooking liquid, then gradually add cheese, tossing until cheese is melted and sauce has emulsified. Remove from heat. Add basil and butter and continue tossing until pasta is evenly coated and butter is melted. Season with salt and pepper to taste. Divide pasta among four plates and sprinkle with the reserved bread crumbs. If desired, fry eggs to your liking and serve on top of pasta.